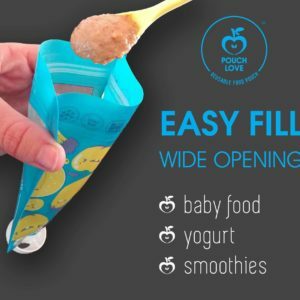 Pack of 5 reusable food pouches Why is Pouch Love the perfect meal-time companion? Big Wide opening for easy filling and cleaning. Strong double zipper with NO LEAKS. Top spout for easy handling, comfortable eating, and direct flow-through cleaning. Area to write the contents and date (use a non-permanent or dry-erase marker). Prepare food at home and know exactly what your child is eating.